There is no occasion like a birthday for cupcakes!! My daughters turned five in January and I wanted to try to make some delicious cupcakes for their family birthday party. We started our meal with crockpot sweet and sour meatballs with rice and salad (sure I will post this recipe one day!!) and then sand a chorus of Happy Birthday and devoured these mouth sized cupcakes. A few ideas for decorating, spread the frosting with a knife and top or dip in coconut for a fancy look. The alternative would be to try to pipe the frosting. At the time I only has one small piping tool which came in a children's baking kit. We since then have bought some piping tools because I am slowly getting used to embracing the baking world. Since then we purchased a simple Betty Crocker piping kit that has quite a few piping bottles so my kids can try their had at decorating too! We froze some of these cupcakes without frosting and since have used some for birthday parties the girls are going to. We just set them out to defrost and make a small batch of frosting so they can enjoy a birthday dessert as well at other children's birthday parties. Hope you enjoy! Mix the above ingredients together in a bowl. Do not over mix. Pour or spoon batter into grease mini muffin pans. Fill batter to the very top of the each muffin cup. 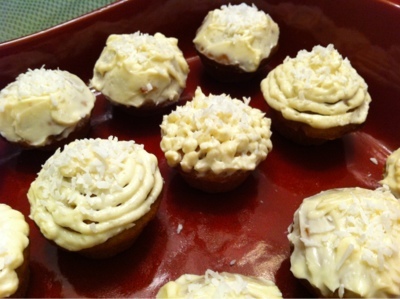 Bake cupcakes for 17-20 minutes until a toothpick can be inserted and come out clean. Remove from oven and let completely cool before frosting. Mix together all ingredients except coconut. 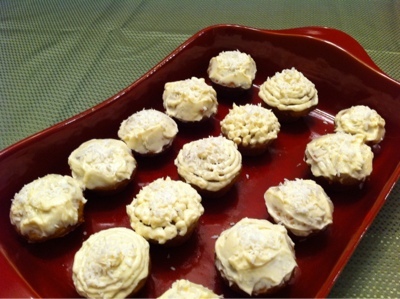 Spread onto cupcakes or pipe onto cupcakes and top with sprinkles of coconut.